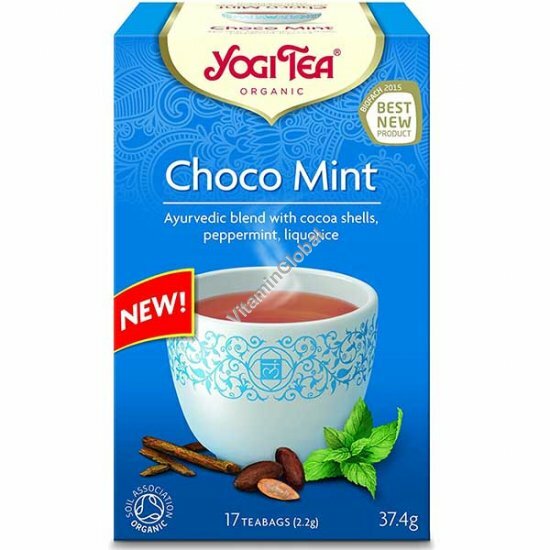 Yogi Tea Choco Mint Spice Organic Tea contains exotic spices from the Far East blended with pure cocoa shells, which give this tea a deliciously unique taste and aroma. The wonderful flavours of peppermint, ginger and cinnamon delicately mingle with the unmistakable essence of cocoa; warming body and spirit! Ingredients marked with * are certified organically grown. Pour 250ml of freshly boiled water over the Yogi Tea Choco Mint Spice Organic Teabag. Allow to infuse for 7 minutes or longer for a stronger flavor. Add milk or milk substitute and sweetener to taste.